Administration Manager at Aurora Gold Mines, Peter Benny speaking with workers on labour relations shortly after speaking with the media. Aurora Gold Mines on Sunday said it was open to having its more than 600 workers unionised, but at the same time Administration Manager, Peter Benny believed that the committee system was working well. “Currently, there is no union and the workers have their own committee that deals with grievances that meet as often as possible, once a month, to deal with issues,” said Benny. Available figures show that an estimated 600 of the 680 workers could be unionised. Asked whether the committee would work better than a union, the Administration Manager said the committees work quicker to solve problems instead of unions. “I have dealt with unions most of my life and I find that the committees can solve their own problems faster. Management is more open to listen to employees by themselves when they come as against when a union gets involved, it becomes acrimonious, confrontational. “We do have some confrontation, but I find that the committees, they work. Maybe the union would be more aggressive. The workers understand the situation much better than a union that is more outside than inside,” he said. Benny said AGM encourages rather than invites unions to vie for recognition in keeping with the Trade Union Recognition Act. He acknowledged that there are “tense moments when workers are not happy about something that we attend to”. 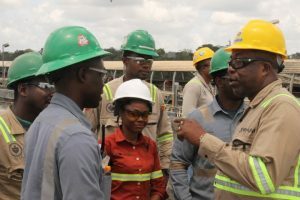 Benny recalled that a Bartica-based registered trade union had attempted to gain recognition at Aurora Gold Mines, but could not have mustered the required number of applications that are required by law. The Administration Manager said AGM tries to meet most of workers’ expectations including wages and salaries, recreation, bereavement. “Right now, the workers deal with their own issues without making contributions to a union but sometimes it’s good for an employer when a union is there. We are not pressured to do things we may not want to do. With a union, we stick to the rules. Benny has interfaced with trade unions for decades in the Guyana Sugar Corporation before joining the mining industry. “I have no problems with unions. ; I actually like unions,’ he said.Benny has interfaced with trade unions for decades in the Guyana Sugar Corporation before joining the mining industry. There are about 70 Guyanese supervisors and 35 expatriate workers at the Guyana-based Aurora Gold Mines. Aurora Gold Mines/ Guyana Goldfield’s Human Resource Policy states, in part, that the company will allow workers to form and join workers’ organisations of their choosing without any interference or employment consequences and to bargain collectively with their employer. That policy also mandates the company to encourage employees to use mechanisms provided to them to raise grievances and to discuss openly any issues of concern they might have and to respond to those grievances in a fair and transparent manner through the appropriate mechanisms in a timely manner. On joining the company, the Human Resources policy requires the company to inform new workers of a grievance redress mechanism which should involve the appropriate level of management. The policy prohibits retribution pr substitute for grievance mechanisms provided through collective labour agreements. At the same time, it allows for administrative and legal redress.